Fat bikes, dubbed the “Hummers of the two-wheelers’ world” are proliferating with more than 150 cross country (XC) ski areas in North America that welcome fat bikes on their snow covered trails. These specially-made bicycles that accommodate ultra-wide tires that can be run at very low pressure 4-8 pounds of pressure allow fat bikes to roll over soft, slippery surfaces like snow. XC ski areas and regional pockets across the nation from Vermont to Michigan and Arizona to California and Washington now have fat bike trails with single track groomed and signed trails and rental bikes, and special events. 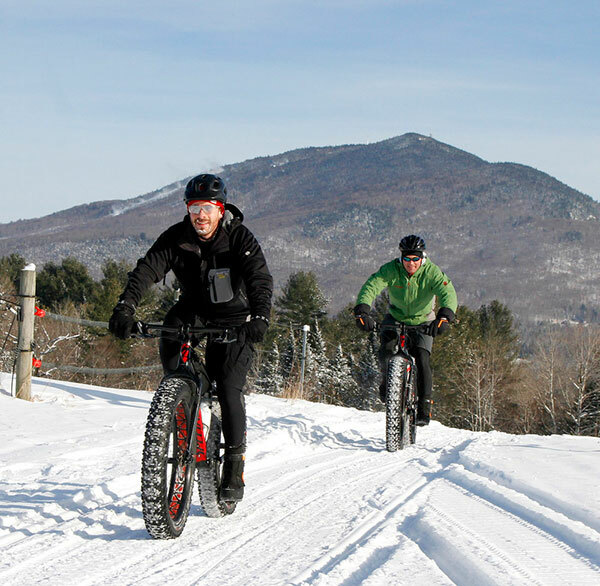 Fat biking at Kingdom Trails in northeastern Vermont is no small matter. It is the foremost mountain bike destination in the east with more than 40,000 day passes sold in 2017 (20% increase from the previous year) and they’ve quickly parlayed this notoriety into becoming a mecca for fat bikers in the winter. Kingdom Trails has 100 miles of bike trails (30 of which are used in winter for XC skiing, snowshoeing and fat biking) and works with 80 different land owners. They also host Winterbike, which is the biggest fat bike festival in the east. The organization conducted a survey of bikers showing that they are generally aged 45-60 and reportedly attract $8-10 million of business to the region!